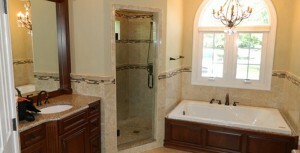 We specialize in the creation of custom bathrooms for our clients in the Mooresville, NC area. When you think of an upscale home that you have admired in the past, one of the things that probably sticks out in your mind is the custom bathroom. This is one of the rooms in your home that offers the highest return on any investment put in to upgrade it. When we wake up in the morning, most of us head straight into the bathroom for a shower. If you are constantly bumping your head on a shower that is too low, or feeling cramped because of the poor layout, it is probably time to consider an upgrade. Taking on a bathroom renovation project might seem fairly simple and straightforward. However, thanks to the popularity of DIY shows and websites, many people start projects that are harder than they expect. Any type of renovation that involves replacing fixtures or working with plumbing should be handled by a professional. The last thing you want is to accidentally break a pipe or damage a fixture, which can lead to a flooding problem in your home. Even replacing cabinetry or flooring is more complex than it looks. At Carolinas Custom Kitchen & Bath Center, we specialize in the creation of custom bathrooms for our clients in the Mooresville, North Carolina area. Because we understand the value that a custom bathroom can add to your home, we will talk to you about all of the options to make sure you choose something you will love on a long-term basis. If you have questions about the process of creating a custom bathroom, feel free to talk to your contractor or stop by our showroom. At Carolinas Custom Kitchen & Bath Center, we install custom bathrooms in Lake Norman, Mooresville, Charlotte, Concord, Huntersville, Denver, Statesville, Davidson, Cornelius, Troutman, Mount Holly, Belmont, Lake Wylie, Harrisburg, Mint Hill, Matthews, Salisbury, and Kannapolis, North Carolina.